I am a retired teacher and got into prospecting as a hobby with my family. We locate mining claims, keep some claims to prospect ourselves for gold on them in the claim creeks and washes, and sell some. We have for sale 20 acre and 40 acre gold mining claims in California, Colorado, and Arizona. Total price of $2000 for a 20 acre gold mining claim. Total price of $3950 for a 40 acre gold mining claim. A signed contract will precede payment. 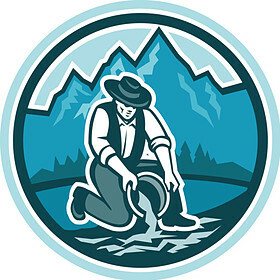 In California and Colorado, each claim has a beautiful creek for prospecting, and our Arizona claims each has a wash known for gold accumulation. A transfer of a mining claim ownership is a sale of legal, exclusive ownership of a mining claim site for prospecting. To be a legally recorded claim, gold had to be found on the claim, which was completed by me, as my wife and I are the original claim locators. and legally recorded with the local BLM and County. A Quit Claim deed is the required legal document per the BLM. Each year, on or before September 1st, you need to file a simple form with the Bureau of Land Management, along with $155 (20 acre claim), or $310 (40 acre claim.) By doing this, you keep the claim forever. You must be a current US citizen with a US address to own a mining claim in the US. I have paid the fee for this year.